Can someone confirm that a done reminder in a note stay forever? My concern is not knowing what I did after a while. Hi. AFAIK a done reminder will be findable until you delete the note. Confirmed: "a done reminder in a note s﻿tays fore﻿ver﻿"
The notes and metadata are preserved in your account until deleted. Thank you both, this is very important to me. You can as well as set it to „done“ delete the reminder. Then it is „gone“. It will show the last reminders data - so if you have a repetitive task on which you reset the reminder each time, the history will (as far as I have seen) be lost except the last round. 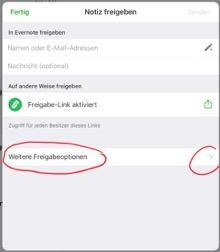 To work around this, keep the original copy with the reminder set to „done“, and copy the note plus set a new reminder on the copy. Then the history is documented in the string of copied notes, each with its own set of reminder data. Just to wrap it up: For my usecase, reminders in EN itself are too restricted. No repetitive reminders, no distinction between reminder date and deadline etc. So I prefer to use a real task manager for my reminders. If I confirm the execution of a repetitive task, each confirmation will stay documented in the log even when it opens the next reminder right away. To build the bridge, I „share“ a link from the EN note into „Things 3“. There I can use all the features build into this task manager. 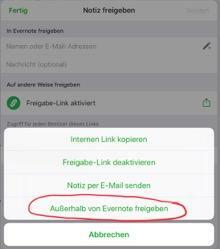 By clicking the link embedded in the task, I can allways return to the original note in EN. Things is fine for a 1-person-show. They have no good options to work in a team. For this there are probably other task managers where the same idea is working. I just have no experience with those (Todoist ?). Probably stuff like Trello should allow something similar based on embedding a link in a KANBAN Card. no distinction between reminder date and deadline etc. When the task is completed the ReminderTime is re-assigned. - I use scripting on my Mac. This resets the date and appends a log to the note contents. Yes, many roads lead to Rome. IMHO one should decide of where to handle reminders. I think that it is better to keep all reminders in one place, than spread them over many applications. The one exception I would make is when on the job a certain tool is obligatory for Task handling, probably with proper group work functions. But then still all professional stuff goes there, and all the private one into another. 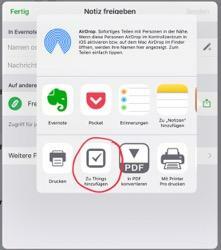 I think that it is better to keep all reminders in one place, than spread them over many applications. I need the Notifications and Snooze features of the dedicated apps. The iOS -proprietary apps I‘ve tried as well. They are straightforward and sleek, and did improve with the iOS updates nicely. But still, I found them lacking this or that, always falling a little bit short of my expectations / needs. So I have them sidelined, checking from time to time after mayor iOS updates. Even when they are not my favorite apps, they are often good problem solvers between other apps. It looks like you're using an Apple device. A great way to connect the two applications is through the shortcuts of Siri, formerly called Automator. I was able to make a shortcut that lists all the notes with the tag "task" and automatically creates a task with the name of the note and with the internal link, there is no need to create a public link. I love Things, I've used it for a long time. Unfortunately my MacBook Air died and I switched to a Galaxy Book. Now I use the Google calendar along with Evernote via Cronofy, it works great, it's easy to see the day's tasks and reschedule them if needed. I realized that using the calendar I have a better sense of time and I can plan better. You have gotten this right, except for our desktop (Win10) and the NAS (Synology) we have switched all the family Gadgets to Apples. Makes digital life much easier, with iCloud integration between devices etc. With Shortcuts i‘ve toyed around a bit, but nothing serious so far. Maybe I should give it another try. Among other features what I like in Things is that it shows the calendar view together with the tasks. I prefer it this way. My professional calendar is open for others to book time there (under certain rules), so I do not want to have my task planing open for others to view. If I need quality time to get some things done, I block a space in my calendar based on when I want or should work on this. This will show the time blocked, but not what I intend to do then.